Shoppers can be fickle, especially now that there’s an endless number of online shops to choose from. And, as a business owner, you surely find it discouraging when one of those shoppers -- or a lot of them -- add multiple items to a checkout cart, only to abandon it without purchasing anything. Who knows, maybe those customers won't ever return to buy those items. There's science behind that concern: In a 2017 survey, Statista asked digital shoppers what their primary reason was for abandoning their carts, and some 40 percent said the reason was that they were only browsing. So how do you reduce shopping-cart abandonment on your ecommerce site and increase conversions? Luckily, there are simple ways to give a little nudge to users that will push them in the direction of the checkout and prevent you from losing out on those sales. Check out these five simple ways to decrease shopping cart abandonment, and get ready to hear that welcome "cha-ching" more often. 1. Use an exit-intent pop-up. Imagine being able to read customers’ minds right when they’re about to leave your site, then to stop them and offer a great deal to change their decision from a "no" to a "yes." Well, an exit-intent pop-up does just that. It can track when a customer is about to leave your site and send that would-be shopper a targeted message at exactly the right time. 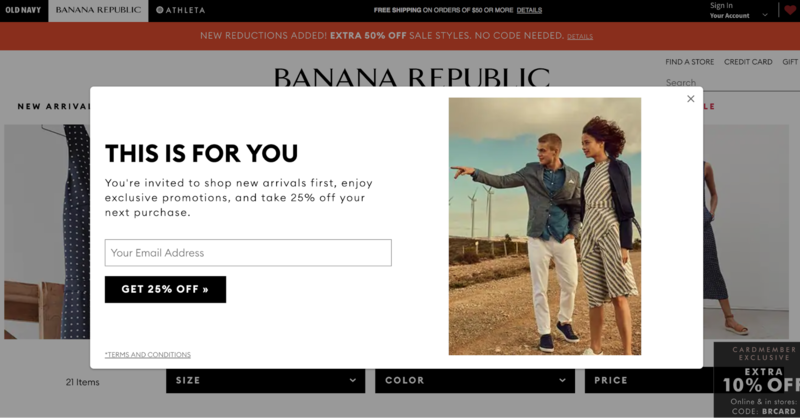 Banana Republic does this really well. After you’ve clicked around the site a little bit and are about to hit the back arrow, the company offers you a discount in exchange for your email address. You can do something similar: Design your own pop-up to remind visitors that they have products left unpurchased in their cart and offer them a discount if they return to buy. 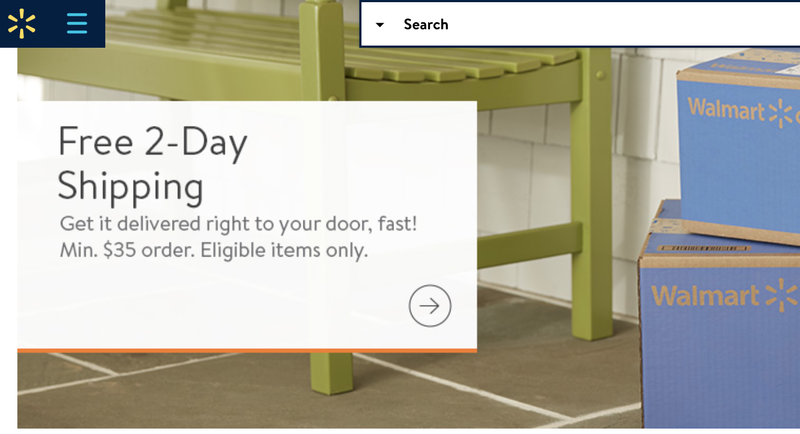 Adding exit-intent pop-ups will stop users in their tracks and help them give a second thought to making that purchase after all. 2. Keep the cart visible. Keeping the shopping cart always in view is a great way to remind customers to buy. People can be forgetful; if they spend a long time on your site browsing after they've added an item to their cart, they might forget it altogether if the cart isn’t visible. For example, Pretty Little Thing includes the cart as part of its sticky header, which doesn’t disappear as visitors scroll down the site. A shopping cart symbol that displays the number of items in the cart will be a useful addition to your site. You can also create a sticky floating navigation menu so that as the user scrolls down, the shopping cart will follow and always be in view. For WooCommerce users, you can install the WooCommerce Menu Cart plugin to easily customize a cart for your site. 3. Don’t surprise customers with extra costs. If you don’t want to offer free shipping, don’t keep customers in the dark about shipping costs until the last second. According to an ecommerce survey conducted by VWO, 28 percent of shoppers will abandon their cart if presented with unexpected shipping costs. That number may not seem high, but it’s actually one of the top reasons for cart abandonment. For example, Walmart has free shipping on orders costing $35-plus. The company tells you that up front so you can plan ahead, and it’s a good upselling opportunity. Someone who was planning on purchasing just $10 worth of merchandise gains an incentive to spend another $25. Let your customers know about shipping charges up front. You can also provide them with a shipping calculator that will determine the cost of shipping to their location and let them choose their desired shipping method. 4. Create the appearance of scarcity. If you’re hungry and you know there’s only a couple of pizzas left at your favorite restaurant, you’re going to buy them up quickly before they’re gone, right? Using that feeling of scarcity on your online shopping site will create a feeling in your visitors that they have to buy now or they may miss out. 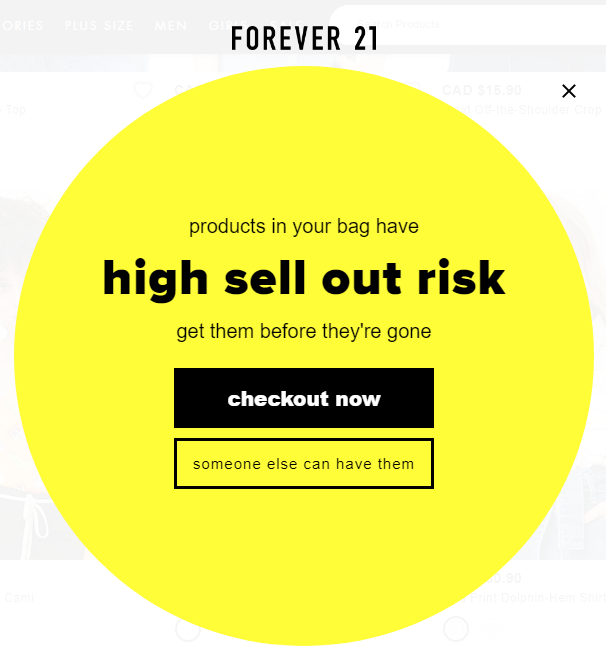 You can use scarcity by displaying a pop-up like the following example from Forever 21. You could also show how many units are left of each item. For example, when a customer adds a pair of shoes to his or her cart, you can show that only three pairs of that style remain. Another great tactic is to display a countdown timer that shows how many days or hours are left until a particular sale is over. Any of these strategies will create FOMO (fear of missing out) in your visitors, and they’ll likely complete a purchase much faster. 5. Allow customers to save their carts. If your visitors still aren’t sure about buying from your site, make it easier for them to come back when they do make up their minds. Saving carts is a must-have for users who shop around on the web and compare prices; this feature makes it more convenient for them to return to you when they don’t have to browse all over again to find the items they originally looked at. Here, WooCommerce users can try a plugin like Recover Abandoned Cart. This plugin monitors when carts are abandoned and automatically sends an email reminder with a link to return to the cart. Related: Shopping Cart Throw-down: Which Ecommerce Platform Reigns Supreme? Other easy fixes to decrease shopping-cart abandonment include making sure your site is super fast, offering a variety of payment options and showing security badges, in order to gain the trust of visitors. If you're tired of losing sales to shopping-cart abandonment, start implementing these tactics on your website and you’ll be able to quickly boost your conversions.